On a sunny Sunday morning, Jordy, a friend from the farm, picked me up to show me Dunedin in style. We kicked things off with brunch at St Clair beach, the place to be seen sipping lattes on a leisurely weekend morning to brush shoulders with the local sports stars. St Clair is a beautiful stretch of sand looking out to tiny White Island which Jordy assures me is so named because all of the bird life which dwells, and poops, there! 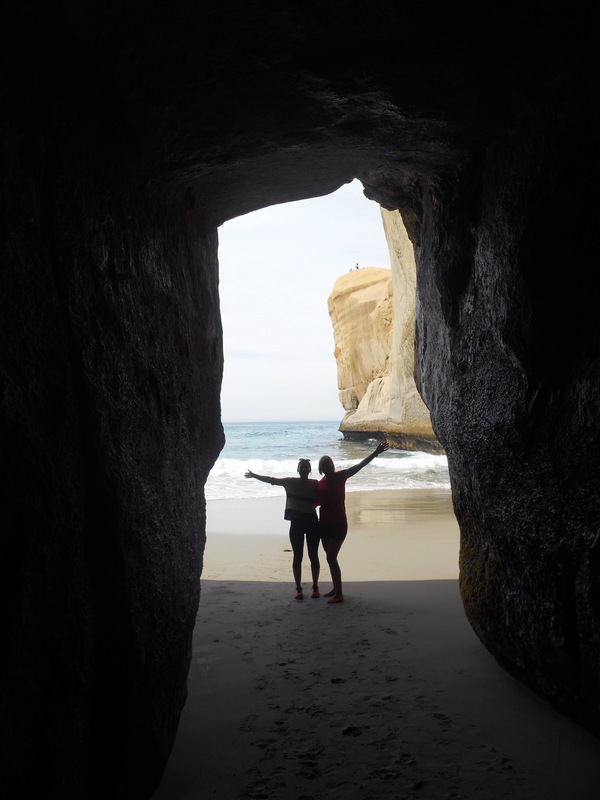 We drove up the coast a little further to explore Tunnel beach. 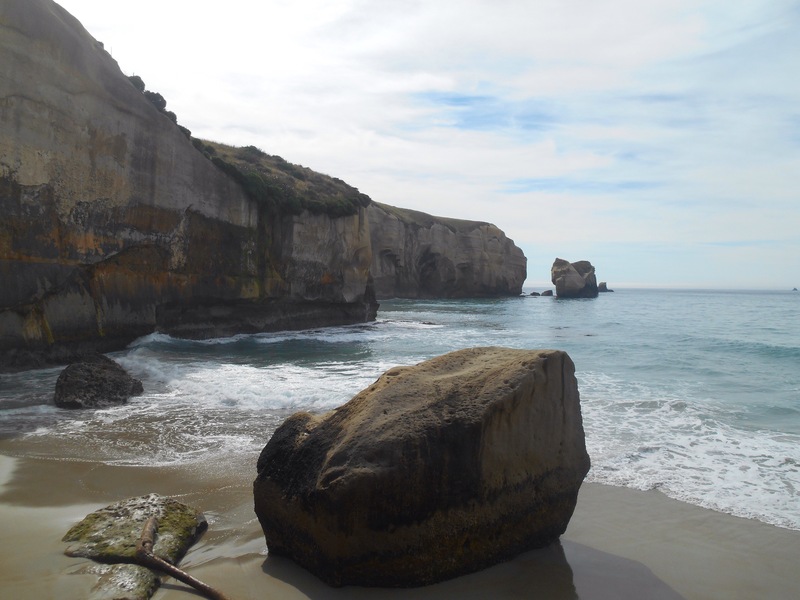 Here the rocky cliffs drop away dramatically, and little inlets and tunnels reveal themselves. 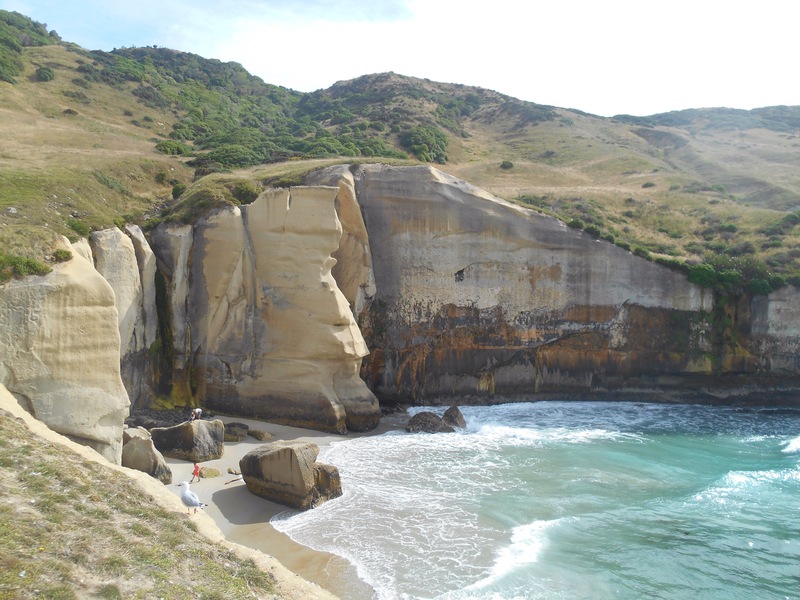 The lone standing rock formations are interesting having been bashed by the seawater into unique shapes. 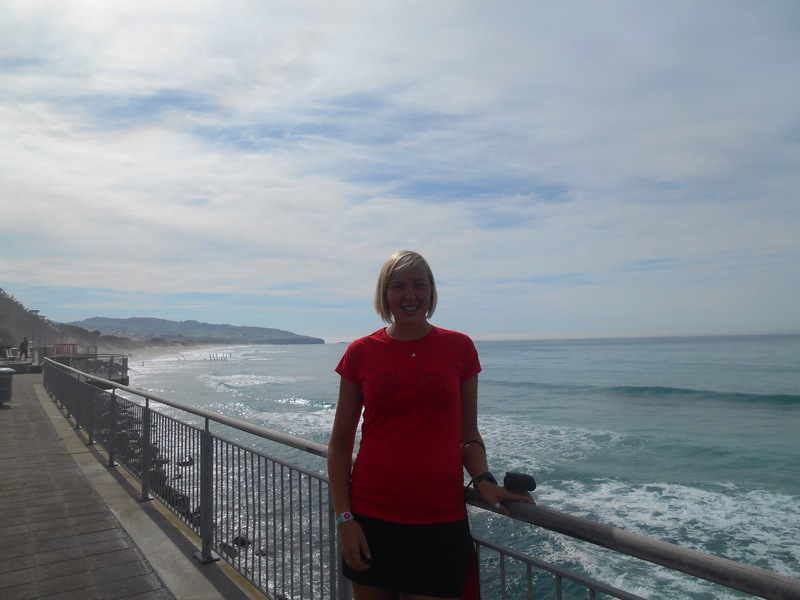 The are reminded me much of the drive along Great Ocean Road in Australia. 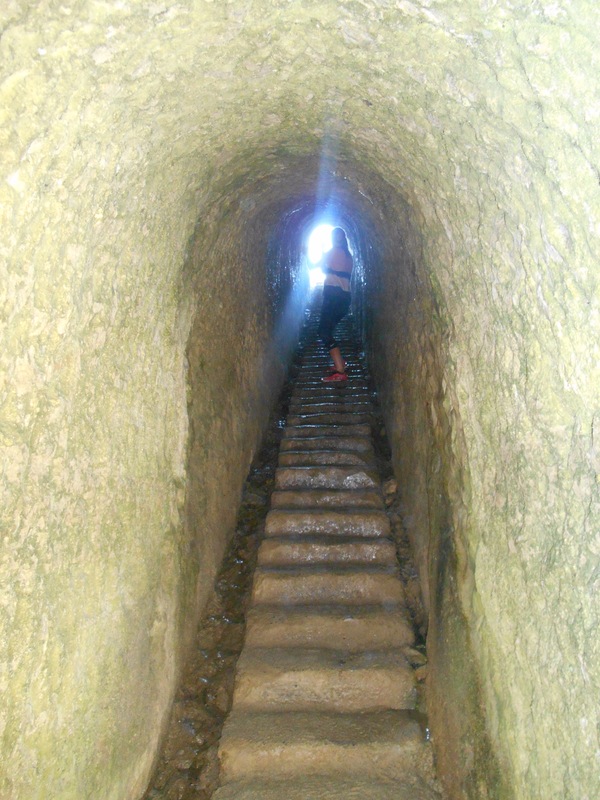 There is a tunnel dug out of the rock where many steps lead down into the cove. This is rumoured to have been dug by a local farmer for his lover, or family, depending on who you talk to. Me, along with a few seagulls dipped our toes into the water before a sweaty trudge back up the hill. 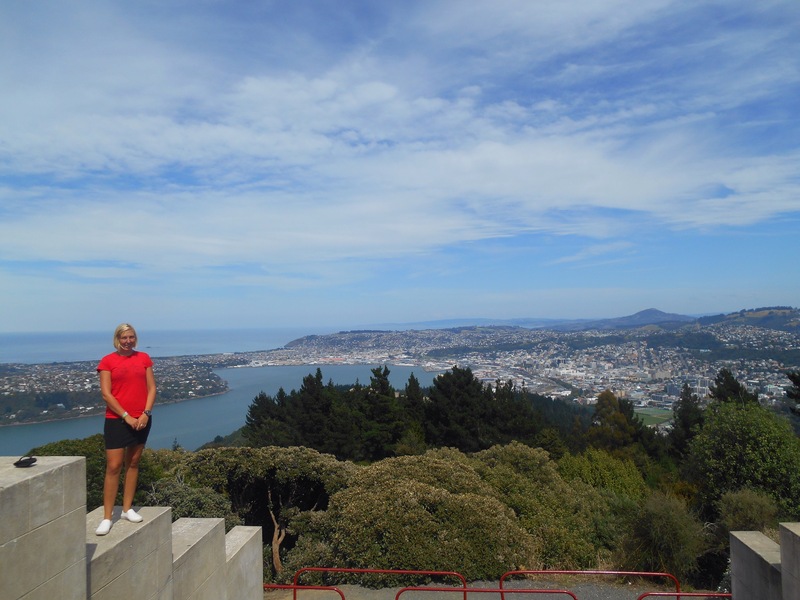 We then whizzed through town, Jordy pointing out the highlights, best coffees, biggest ice creams as well as the geology of Mount Cargill and the Otago Harbour which orientate you in the town. 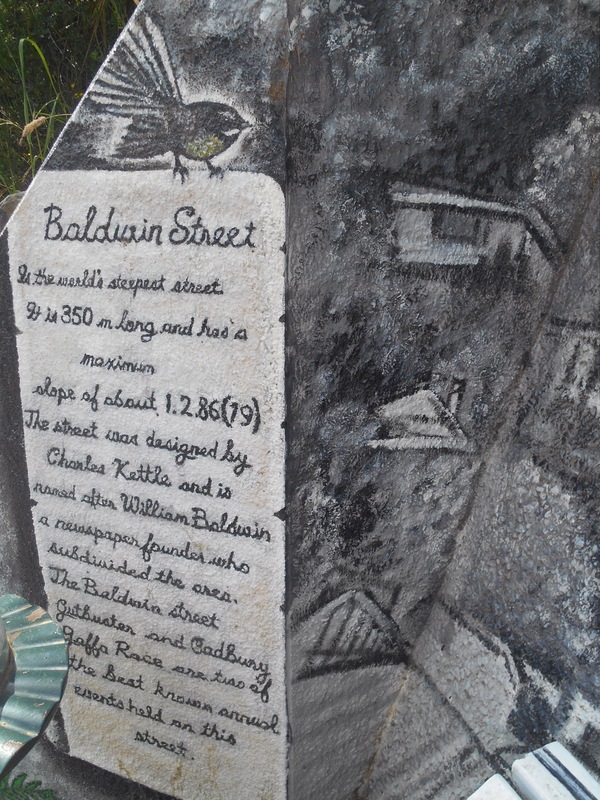 In the northern part of Dunedin is Baldwin street, the steepest street in the world. There are several running and cycling races on this short, steep stretch, including throwing Jaffas (chocolate orange balls) down it once a year. We took a walk up giving our calves a reason to complain and within a short distance we had gained great height, the people and cars shrinking right down. There was a beautiful mural at the top, a water fountain and a great view of the city. 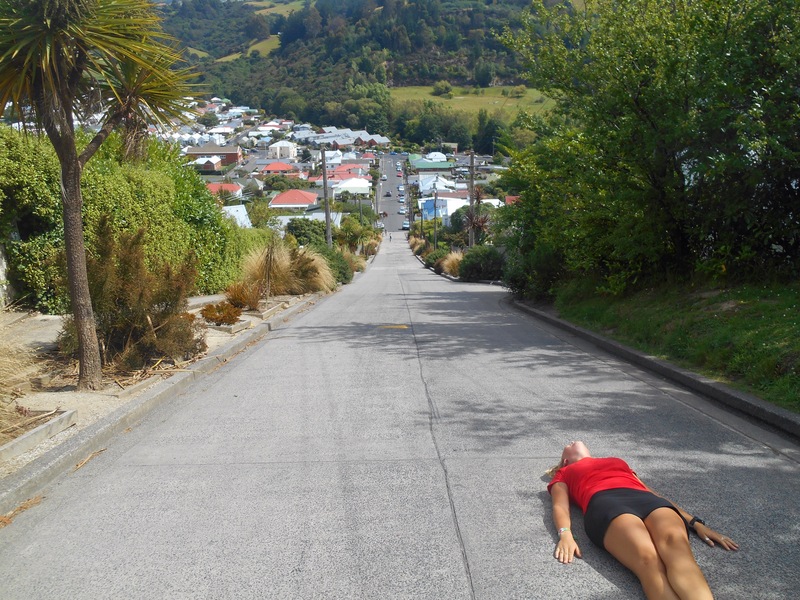 On the steepest stretch of incline I laid down with my head first down the hill so you could really feel the incredible gradient. We quenched our thirst at our final stop of the “Jordy tour” in the shopping area of the city. The shop fronted streets lead to the Octagan, or as its affectionately known, ‘the octy’ which has bars and cafes spilling out onto it. Robert Burns overlooks the lovely square and older buildings and churches make up the cultural touches of this city. 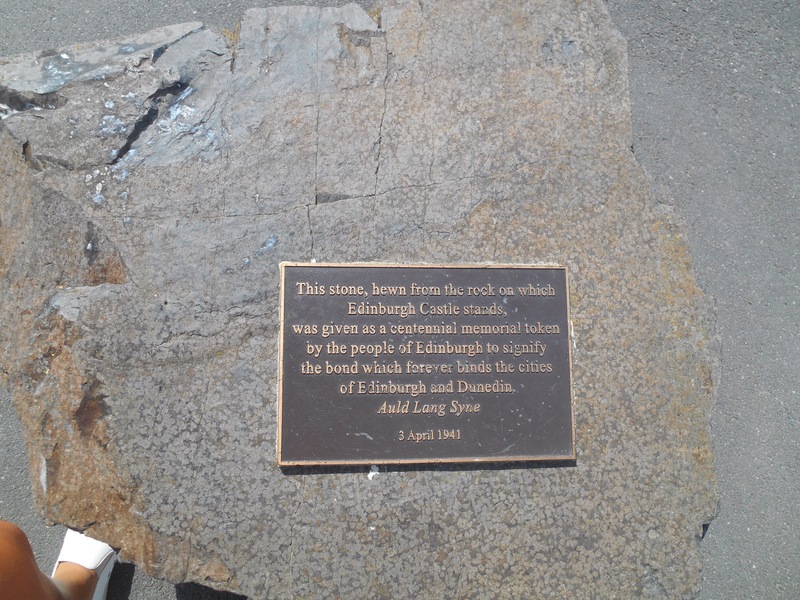 Dunedin is the old Celtic word for Edinburgh and New Zealand’s first city. It retains its heritage links and is picturesque. 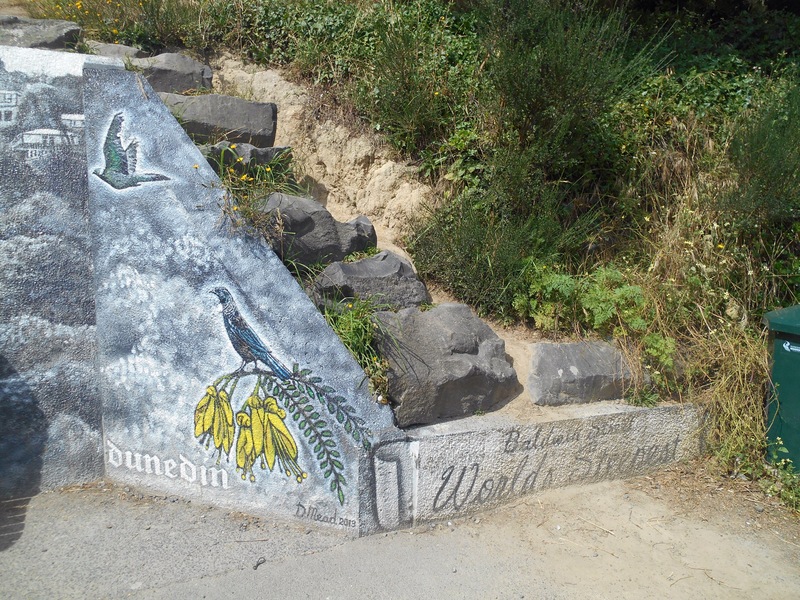 I spent the hot afternoon in the botanic gardens which spawns one of Dunedin’s many hills. With pockets of South African, Lebanese and Celtic, it was nice to peruse the changing vegetation ending as every botanic garden trip does, sprawled under a big tree with a book. In my large hostel room, a conversation was struck up between the girls and a plan hastily formed to see a movie. Only half aware it was Valentine’s Day, we quickly grew from strangers to sisters as we watched Suffragette in a screen we had entirely to ourselves. Nothing like female empowerment on Valentine’s Day to steadfastly bind a group. The travel conversation spread to brunch the next day in one of the cities many cafes. I had planned a days cycle out to the peninsula but as we swapped from book recommendations to European politics, it was soon 1pm. I visited the Otago Settlers Museum, an interesting collection of those who have made up this once bustling area, from the Kai Tanu tribe who first inhabited, to the Celtic influences which signifies much of the city today. As with every museum discussing the colonies, there was the section of ship life and making the journey. This museum had captivating short movies about life onboard which I realised I was enjoying a little too much when someone else skipped the movie to its final snippet and I was shocked to find the young baby in the movie hadn’t survived the journey. I then hopped on my bike to follow the water of the Otago harbour to Port Chalmers, a quaint port town where the cruise ships dock. After a decent cycle through the villages which make up the cities perimeter, it was nice to stand at the Flagstaff lookout and look back on the bustling life which was quickly left behind. 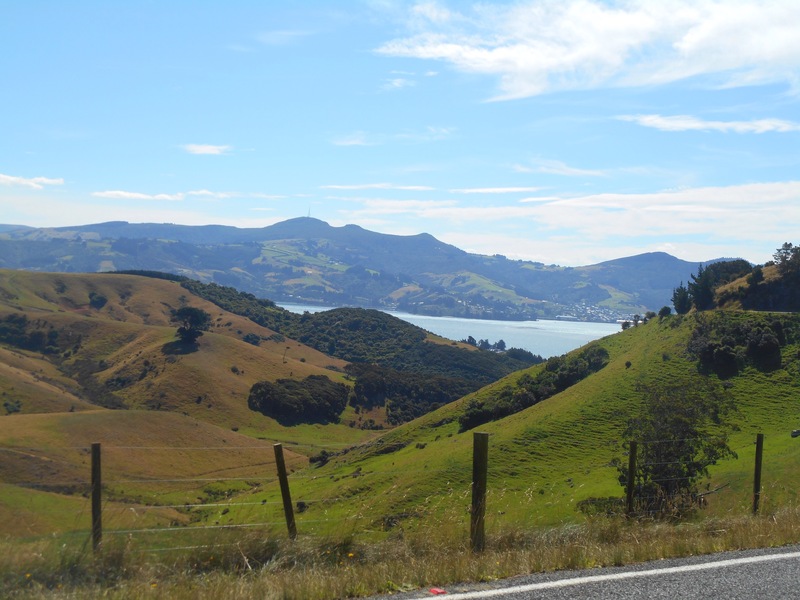 Determined to cycle the 75km round trip which would take me out onto the Otago Peninsula, I set off in good time to follow the lie of the land. 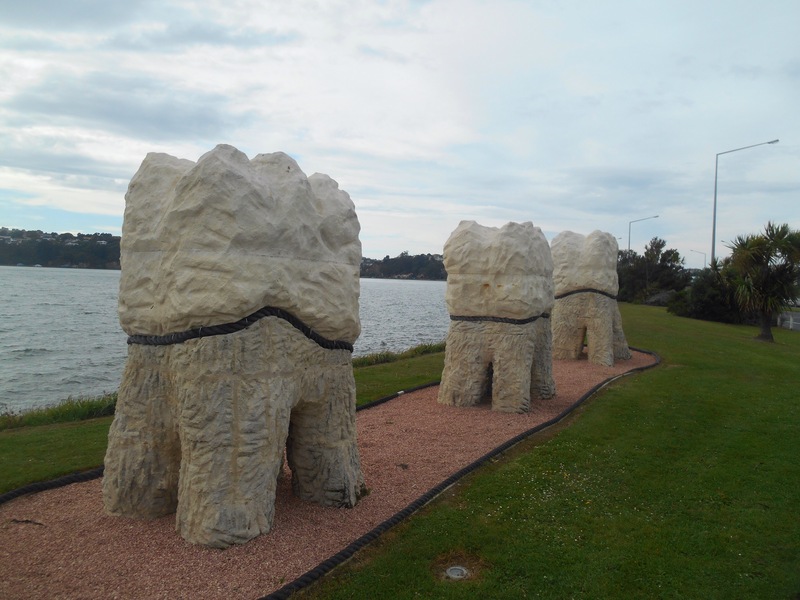 The teeth sculpture, a clever representation of the mouth of the harbour. The flat path followed the harbour, many inlets hiding the city and revealing more mountainous green and small settlements. The most populous, about 20km was my coffee stop, Portabello, then the road continued on to the very end of the road, the final jut out to see, Tairoa head. After a short climb, the head was filled with the noisy chirps of much bird life. Albatross and Penguins call this land home. 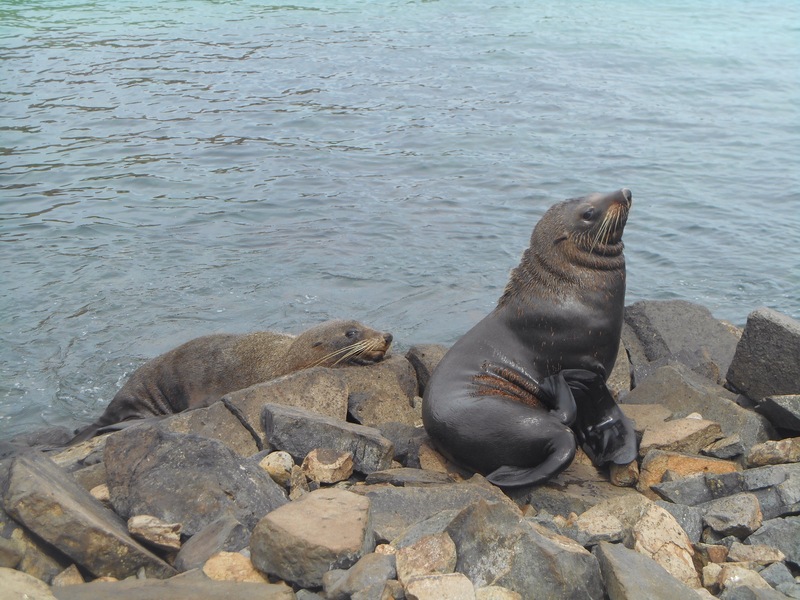 At this time of day neither of these things would be sighted, the albatross fishing and the Penguins out to sea, however the sea lions were lulling lazily on the beach, rolling and groaning as they digested much like an over indulged child on Christmas. They did not smell as good as they looked, and occasionally barked at each other feistily. I absorbed the calm of this isolated peninsula before turning and heading back to Portabello where I this time took Highcliff road. It was a 13km uphill route that took me inland and through hilly farmland but through the salty tears in my eyes, the view was magnificent with coast in every direction. 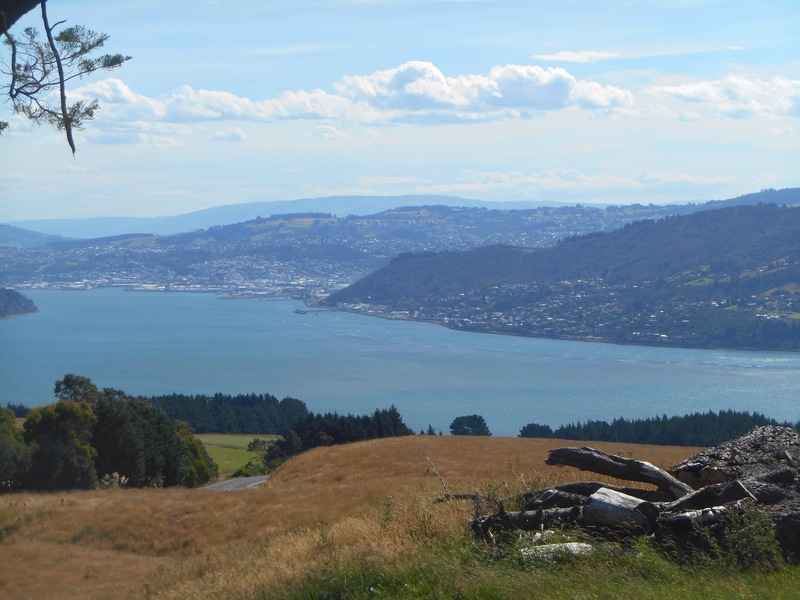 I passed sheep, traversed a collapsed road and battled a headwind to get to the point where the wheels started to point down, the whole of Dunedin in sight from the elevated view. It was a fun descent into the loveable city. 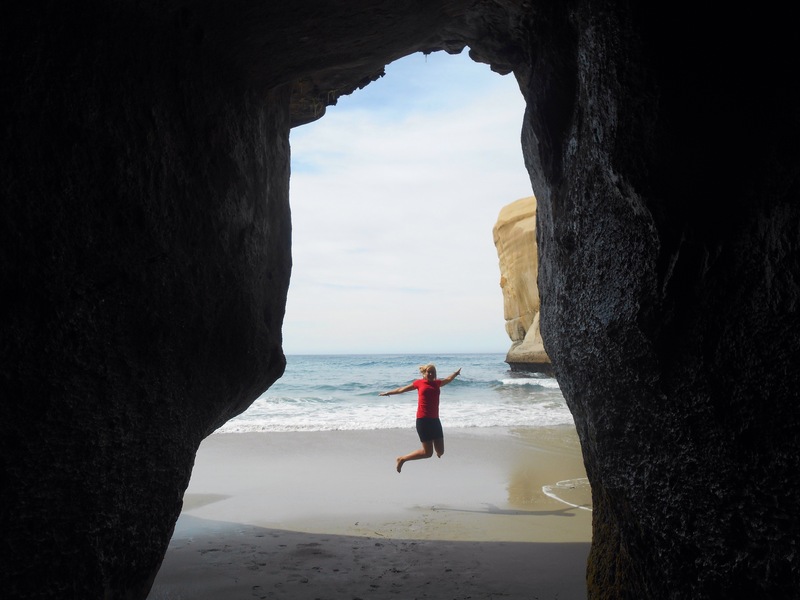 And reluctantly, that’s the end of a short stint in the student city as, despite the warnings of sparse and strange happenings, I head even further south to the Catlins. Are people in southland even aware of such mod cons as colour tv and the Internet? We shall find out..